US PRESIDENT DONALD Trump has stumped for his former rival Ted Cruz, a pair that had long exchanged barbs but now share a Texas rally stage just two weeks before the congressional midterms. The political equation is simple: Trump needs Cruz to maintain Republican control of the US Senate, while Cruz is all too aware that a presidential seal of approval could help him in his face-off with rising Democrat star Beto O’Rourke. During the 2016 campaign, Trump infamously insulted the looks of Cruz’s wife Heidi, vaguely suggested Cruz’s father had played a role in John F Kennedy’s assassination and tagged him with the nickname “Lyin’ Ted”. The 47-year-old junior senator from Texas fired off insults of his own, calling Trump a “pathological liar” and “utterly amoral”. But sporting black cowboy boots, Cruz welcomed the president to the Lone Star State on the tarmac as he descended from Air Force One. 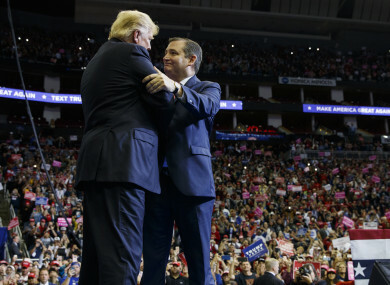 “He’s not Lyin’ Ted anymore,’” Trump told reporters before leaving for Texas, bestowing Cruz with two new nicknames: “Beautiful Ted” and “Texas Ted”. “He defended your jobs. He defended your borders,” Trump said later at the rally. “We are defending together with other great Republicans your freedom,” he said, encouraging Texans to “get out there and vote”. Thousands of Trump supporters arrived hours in advance of the rally – swarming streets around Houston’s Toyota Center stadium in a festival-like atmosphere that was to include live music and food trucks. Some had camped overnight, bundled up against the frigid temperatures, according to local media. Trump focused particularly on immigration, a tender point in the border state of Texas. The rally is timed with the beginning of early voting in the state. Local media reported unexpectedly heavy traffic at polling stations, where some also camped overnight in order to cast their ballots. With national attention on Houston, O’Rourke campaigned in various spots around the city to boost supporters and encourage them to vote early. “We are here for everyone,” O’Rourke told a crowd in Pasadena, a Houston suburb, “Republicans, Democrats, independents alike”. Opinion polls still have the ultra-conservative Cruz in the driver’s seat, but he is far from the cake-walk win he and the party initially predicted. “Beto”, as supporters of the 46-year-old O’Rourke call him, is making life difficult for Cruz. While positioning himself firmly on the left, O’Rourke has eschewed the anti-Trumprhetoric systematically rolled out by most of his party – a move that has won over voters. Some even say O’Rourke could be the party’s saviour in the next presidential election in 2020. Trump has called O’Rourke a “total lightweight” but the Democrat has opted not to trade insults with the president on Twitter. “I don’t know that it makes any sense to respond,” O’Rourke told ABC News. Though Trump sang the praises of Cruz last night, two years ago the pair were hardly friends. Cruz was the last man standing against Trump in the primary – and the campaign got ugly. Trump gave vague credence to a report from The National Enquirer tabloid that Cruz’s Cuban-born father Rafael had been friends with Lee Harvey Oswald, the man who assassinated John F Kennedy in 1963. Cruz, in turn, accused the Manhattan real estate mogul of being the source of another Enquirer article that alleged the senator had been unfaithful to his wife. After the primaries, Cruz took a long time to formally endorse Trump, even going so far as to accept a speaking slot at the Republican National Convention in July 2016 – and withhold his support. Instead, Cruz urged Republicans to “vote your conscience”. Only in September 2016 did Cruz eventually say in a Facebook post that he was voting for Trump. As is often the case, Trump’s tweets on Cruz tell the story about the evolution of their relationship. Email “Remember when Cruz was 'Lyin' Ted'? As an election looms, Trump has come up with a new nickname”. Feedback on “Remember when Cruz was 'Lyin' Ted'? As an election looms, Trump has come up with a new nickname”.